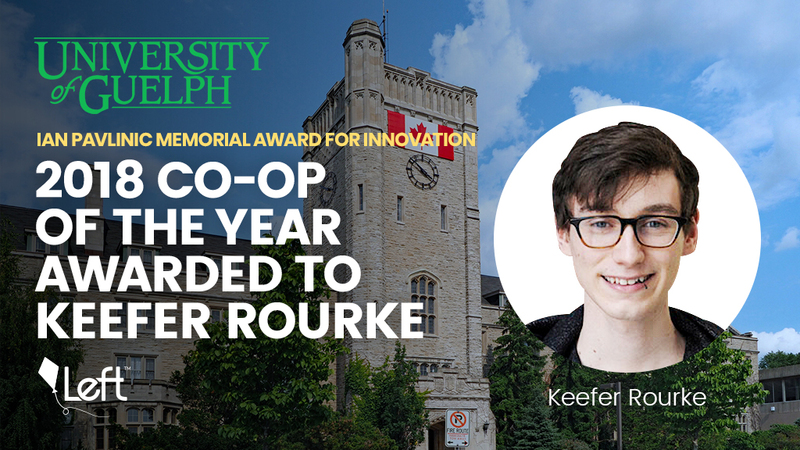 We’re excited to announce that Keefer Rourke, RightMesh (a project of Left) Software Developer and student in the School of Computer Science, has been named the University of Guelph’s Co-op Student of the Year 2018 — Ian Pavlinic Memorial Award for Innovation. The Ian Pavlinic Memorial award recognizes the outstanding contributions of a student in the areas of academic achievement, workplace performance, innovation, contributions, involvement within the community, and impact during the work term. Keefer went above and beyond in all categories. Keefer has shown leadership and accountability with all the work he has done. His passion and follow through on his commitments are outstanding. Keefer has always been very detailed and made small improvements to our code and process that have made a big impact on the team. Keefer has made significant contributions to the project and our development process, and he has improved our code base. His passion for privacy and security has shown and he helped formulate the task force and efforts on improving our security throughout our different systems. During his Co-op placement, Keefer worked on eNuk, a multi-year collaborative project powered by Right Mesh to empower and connect northern Indigenous communities. Throughout the term, Keefer worked closely with Dr. Jason Ernst, RightMesh CTO, and Dr. Dan Gillis, Associate Professor at the University of Guelph and Scientific Adviser for RightMesh, along with community partners and team members, on updating the health and environmental monitoring application to make use of Wireless Mobile Mesh Networks to mitigate connectivity issues in particularly vulnerable areas in Canada. Keefer’s great work on the eNuk project led him to speak at the 2018 Indigenous Mapping Workshop, the largest international geospatial conference for Indigenous governing bodies and communities on Indigenous-led geospatial research. Out of the 40 speakers, Keefer, alongside Dr. Daniel Gillis and Nic Durish, were invited to present an opening keynote speech and facilitate a two day workshop. Keefer leading a workshop on the problems with conventional internet infrastructure in remote areas. His presentation and work on eNuk are just two of many ways in which Keefer contributed to the RightMesh project. Throughout his term, he far exceeded our expectations of a co-op in every aspect. In addition to receiving the Ian Pavlinic Memorial Award for Innovation, Keefer has been selected as the University of Guelph student to put forward for the Education at Work Ontario and Co-operative Education and Work-Integrated Learning Canada Co-op Student of the Year Award. Keefer will be greatly missed by our team, but we cannot wait to see what he does next! Congratulations from all of us at RightMesh!